Thin. Stringy. Straggly. Three little words that so many women use to describe their hair! There’s just something to be said for a full head of long, thick, beautiful shiny hair…it’s every lady’s dream. But for most of us, it’s just not something we’re blessed with. Enter our gorgeous Tape Hair Extensions! Our Taped Hair Extensions do not contain any chemicals or harsh adhesives but provide an amazing secure attachment for up to 12 weeks! A thin light strip of simple tape comes attached to the top of the hair product which is then cut to fit any specific area where you would like more hair. They not only provide length but at the same time they will add fullness. You can even highlight or low-light with our Tape Extensions if you do not want to use hair dye or are allergic to hair dye. 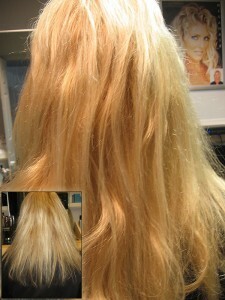 Adding highlights or low-lights using our extensions takes a fraction of the time too! Length, fullness and color all from one product!!! Taped Hair Extensions are for adding length and fullness and cannot be attached above the roundness of the head. They are not intended for covering up thinning hair at the top of the head. Please see our Woman’s Hair Replacement for top of the head coverage. Taped Hair Extensions come in two lengths, 14″ and 18″, wavy or straight, in over a dozen colors, and they are 100% high quality European hair. Looks and Feels Like Your Own Hair! We are experts at perfectly matching the hair extensions to your hair color and style. Not only does it look like your hair, it moves and feels like it, too. Call for a consultation appointment today and look beautiful tomorrow!